In 2011, agricultural land covered 19.6% of nature protection areas of various types in Slovenia. 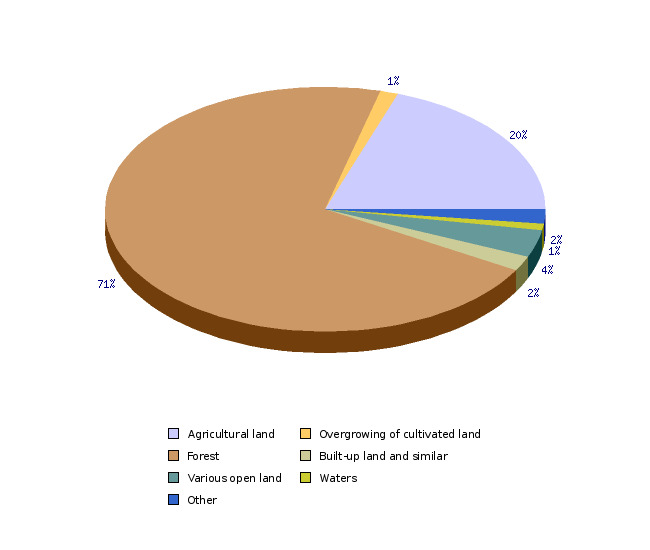 24.9% of all agricultural land is included in nature protection areas. In the past, agriculture in Slovenia has contributed to high diversity of species and habitats and played a key role in the shaping ofcultural landscape. Creation of protected areas is only the first step towards the preservation of traditional agricultural habitats; these habitats will only be preserved if the farmers have an economic interest in maintaining them. Nature areas under protection include the Natura 2000 network and protected areas such as parks, reserves and natural monuments. 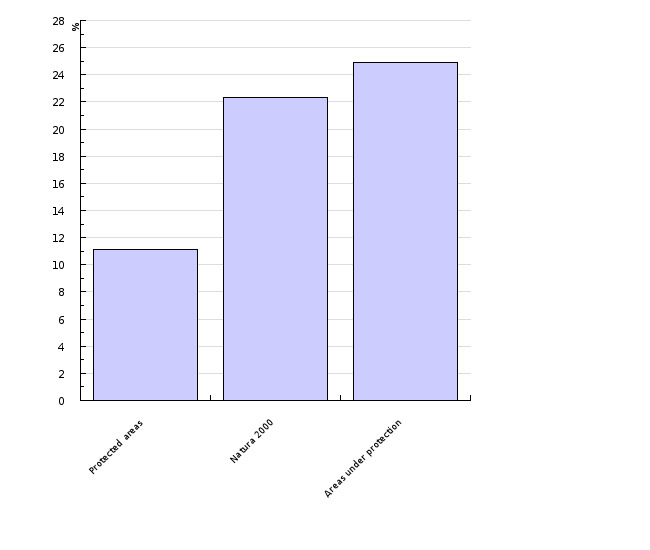 Types of land use in protected areas are presented in this indicator. The role of agriculture in biodiversity preservation is presented by the share of agricultural land in the total surface area of protected areas. The indicator thus presents land use in protected areas, but does not provide direct information on the attainment of a favourable state of wild plant and animal species, their habitats and habitat types within these areas. Environmental Agency of the Republic of Slovenia (EARS), 2011; Land Use - Ministry of Agriculture, Forestry and Food, 2011; data processing Agriculutal Institute of Slovenia, 2011. The Habitats Directive (Council Directive 92/43/EEC), defining the Natura 2000 European Ecological Area, plays a key role in the protection of biodiversity. One of the more important goals of the Directive is to maintain a favourable state of agricultural habitat types. In other words, the goal is to preserve traditional and/or organic farming in Natura 2000 areas in order to preserve plant and animal species and habitat types. Due to various natural conditions and preserved states of nature, the definition is flexible enough to allow for various interpretations of the Directive among EU countries. Nature protection areas include those within the Natura 2000 network and those under protection (national parks, regional parks, landscape parks, strict nature reserves, nature reserves and natural monuments). A large percentage of protected areas in relation to territory is a consequence of unfavourable conditions for agriculture, the great natural diversity of Slovenia and relatively environmentally friendly land use, which is reflected in large forest cover, mosaic distribution of agricultural habitats and a large share of meadows and pastures in the agricultural land structure. In 2011, the surface area of agricultural land within protected areas was 151,731 hectares, which was similar to in 2008. On the national level, the share of agricultural land included in various types of protection is currently 24.9%. In 2011, agricultural land covered 19.6% of nature protection areas, which were mostly covered by forest (70.7%). Semi-natural habitats have an important role in the Habitats Directive. These are agricultural habitats that were created over the past centuries by traditional farming or from the impacts of agricultural land use on the environment. It enabled the development and existence of semi-natural plant and consequently animal communities, thus contributing to greater biodiversity. For example, such habitats can be found on dry karst plateaus where regular mowing once per year prevents the land from becoming overgrown by shrubs and trees and supports biologically diverse meadow communities. Recently, the existence of such habitats has been threatened by the expansion of natural vegetation and urbanisation. Traditional or organic methods of farming are thus a condition for the preservation of such meadows. In Slovenia, semi-natural habitats interspersed with other land under cultivation largely create a unique cultural landscape. As a map of habitat types has not been produced so far for Slovenia and since it is a very important (basic) sub-indicator, a comprehensive, interdisciplinary (involving experts in the fields of agriculture, biology, forestry and animal husbandry) overview and mapping of agricultural habitats of special importance should be carried out.